Spring is the most wonderful season of the year, but as winter drags on, it always seems a long way away. So early-flowering shrubs are always welcome in the garden, because they herald the things to come, telling us that the cold weather will soon be gone, and summer will arrive again. The Forsythia, also sometimes called the Easter Tree, is a very early blooming shrub, that is often the first flowers we see as winter finally passes away for another year. With their glorious golden flowers, completely covering the leafless branches, these glowing shrubs transform themselves into beacons of beauty, lasting for several weeks in bloom, because the weather is still cool, and the low temperatures preserve the flowers. This versatile and hardy plant grows across all the cooler parts of the country, and with modern breeding new varieties have been created that will bloom consistently even in cold zones. Before the arrival of these hardier plants, in cold areas the older forms could fail to bloom in some years, following cycles of warm and cold weather. These newer kinds are smaller too, for our smaller gardens, so they can be grown in the corner of a bed, without taking up precious room needed for summer flowers. With more room you can grow several, filling your shrub beds with early color, and summer structure, or even plant them as a hedge, which will define a boundary with a golden line visible from everywhere. In whatever way you choose to grow this plant in your garden, it will rapidly become an old friend, re-visiting every spring, a reliable and easy to grow signal that spring has returned once again. Forsythia grow as smaller to medium-sized deciduous shrubs, with simple green leaves that flower very early in the year, just after most of the snow has melted. It is not uncommon to see Forsythia in bloom while some snow still lies in shady corners. The blooming is spectacular – every still-bare branch is smothered in bright yellow flowers, which are a little unusual in having 4 petals, evenly arranged, instead of the much more normal 5 petals on flowers. The flowers are between 1 inch and 1½ inches long, shaped like a bell, with the petals flaring out at the end. Flowers are in clusters, so a branch will be completely smothered in bloom. The bark is a golden-brown color, green when very young, but quickly turning light brown, and then darker with age. As the flowers fade, the leaves emerge. These are a simple oval shape, with a slightly toothed edge, and between 2 and 5 inches long, depending on the age and vigor of the stem they are on. They are arranged in pairs, opposite each other on the branch. A mature plant may be anywhere from 3 to 10 feet tall, depending on the variety, and how much pruning has been done. The plant is bushy, with many branches rising more or less directly from the ground, and forming an upright or arching bush. In summer the leaves are green, and this is an excellent background shrub. Then in fall, especially in full sun, the leaves turn shades of red, adding a new note of interest, before falling to the ground with the arrival of winter. As for hardiness, Forsythia will grow easily from zone 5 to zone 8, covering most of the country. Some varieties, like ‘Lynwood Gold’, also grow in zone 4, where winter temperatures drop to a chilly minus 30, yet still bloom reliably just as soon as the snow has mostly gone. This shrub thrives in full sun, or in partial shade, so most garden locations suit it perfectly. 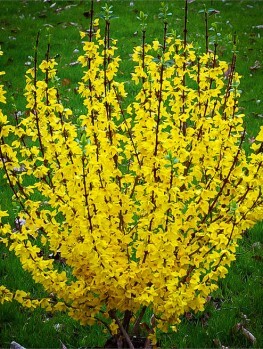 Most varieties Forsythia of will grow in all kinds of soil, including heavy clay. It will grow well in dry soil, and once established it is drought-resistant in summer. Although it will be happy in damper soils, it should not be planted in wet, poorly-drained soils, as root rots may occur. Forsythia is rarely eaten by deer, and will even grow underneath a Black Walnut tree, where most other bushes fail completely. It has no serious pests or diseases, and although some pruning once a year is advisable, it is basically a maintenance-free plant. Forsythia can be used as a specimen shrub in any shrub border, and it is ideal for placing at the back of other shrubs. In spring, it will be easy to see it in bloom, as the plants in front will still mostly be dormant. Later it will act as a neutral green background to their summer and fall blooms. It can be included in the foundation planting around your home, and always remember to plant it where it is visible as you come and go. A good location would make it visible from a window, so that in spring, when it is still too cold to spend much time outdoors, you will see it in bloom, reminding you that your garden is coming back to life. These hardy shrubs make great hedges and boundary plants, as they do not grow too tall, but still give some privacy and protection. A row of them, planted about 4 feet apart, will soon become a wall of gold in spring, and green all summer. You can trim them, or leave them to grow naturally, perhaps simply removing completely the oldest branches every few years, to keep your screen vigorous and growing densely. 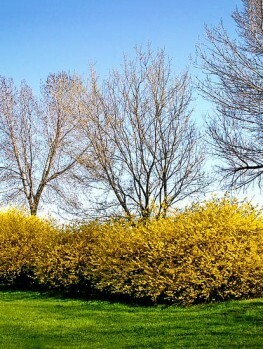 All Forsythia shrubs can be trained onto a wall, and the Weeping Forsythia is especially effective when grown this way. With its hanging branches it will grow upwards, and then cascade down, creating a charming effect. It can also be grown at the top of a terracing wall, where it will hang down and soften the hard lines of the stone or brick. Forsythia is a small group of flowering shrubs, mostly originating in China, Korea and Japan, but there is also a European species, found in south-eastern Europe. From a gardener’s point of view, they are all very similar, with only minor differences in leaf shape, flower size and appearance. Although the genus contains around 13 species, most garden plants are a hybrid of just two species. Since the natural species are rarely seen, let’s consider the hybrid first, which is the parent of almost every variety grown in gardens. This plant is usually considered to be hybrid between two species, Forsythia viridissima and Forsythia suspensa var. fortunei. The original plant was found in 1878 by Herman Zabel, growing as a seedling in the Göttingen Botanic Gardens in Germany. Zabel was a master gardener and tree breeder, and the director of the Forestry Botanical Garden of the Royal Prussian Academy of Forestry in Hannoversch Münden, near Göttingen. He formally named this hybrid in 1885, and probably sent plants to the Arnold Arboretum at Harvard University in 1889. From that original plant, many further plants have been grown from seed, a lot of them produced by Dr. Karl Sax, at the Arnold Arboretum, during his years there, which was from 1928 to 1954. Since each seedling is different, many varieties have been produced, each with slightly different characteristics, such as the precise shade of yellow of the flowers, ultimate size, hardiness, and other features too. Some of the varieties are now rare, but here are the best and most-widely available forms. Unless otherwise mentioned in the descriptions, all are selections from Forsythia x intermedia. The latest news from botanists is that this plant may in fact not be a hybrid at all, but a natural species. The results of scientific progress can be frustrating to ordinary gardeners. . .
‘Lynwood Gold’ – A classic and always popular plant, found in a garden in Country Tyrone, Ireland, in 1935. Upright, with large flowers evenly distributed along the branches. Known as simply ‘Lynwood’ outside the USA. Show Off (‘Mindor’ PP# 19321) – This newer variety was patented and released in 2005 by Spring Meadow Nursery, MI, but bred in France by Jean-Paul Davasse. This bush stays below 6 feet in height, and with some pruning can be kept closer to 3 feet. The smaller size makes it very suitable for smaller gardens and mass planting. Heavy bloom from top to bottom is produced, even on young plants. ‘Ottawa’ – A selection of Forsythia ovata, developed at the Central Experimental Farm, a botanic garden in Ottawa, Canada. The buds are not killed in zone 4, but the flower color is a soft yellow, rather than the golden yellow of most other varieties. ‘Northern Gold’ – Another Canada variety, from D.R. Sampson, a breeder at the Central Experimental Farm. Its flowers are strong, bright yellow, and it is very cold-hardy. ‘Karl Sax’ – An old variety from Arnold Arboretum, with large, deep-yellow flowers. Bred of course by Dr. Karl Sax, and released in 1944. ‘Beatrix Farrand’ – Another Dr. Sax hybrid with slightly paler flowers. Released in 1944. Now hard to obtain and largely replaced by improved modern varieties. ‘Meadowlark’ – A hybrid of Forsythia ovata and Forsythia europaea. Very hardy, even to minus 35 degrees, so it will grow in warmer parts of zone 3. Showy and heavy flowering, but only when well-established, after several years of growth. Large, with arching and sprawling branches, 9 feet tall and up to 12 feet wide, so it needs plenty of room. This plant, Forsythia suspensa, is the most distinctly different of all the Forsythia species, and wild plants can have different habits of growth. A form usually called Forsythia suspensa var. fortunei is mostly upright growing, and is one of the parents of the hybrid ‘intermedia’ group of garden plants. The other, known as Forsythia suspensa var. sieboldii, has more pendulous and even prostrate branches. These different names probably have very little validity, but forms of this plant with pendulous, weeping branches are grown from time to time as ground-cover, as a trailing plant hanging over a wall, or tied to a wall as a vine. The large, bright-yellow flowers, over an inch across, open over a long period of the early spring, and this plant is a useful addition to a gardener’s range of trailing plants. It will grow to around 10 feet tall, or even more if trained up as a vine. The main branches are more upright, and the smaller branches weeping. Forsythia are trouble-free and very easy to grow. This makes them ideal plants for beginner gardeners, and their early flowering appeals to more experienced ones too. The only time problems arise is when they are planted in soil that is badly-drained and often wet or flooded. Plants in those locations can rot at the roots. For this reason, choose a spot which is well-drained, or plant it on a raised mound of soil, if the spot you want to use is wet and low-lying. Be sure to water regularly when newly-planted, and during long dry spells, especially if you have shallow or sandy soil. 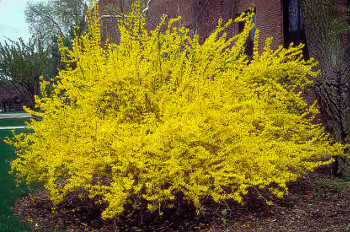 In areas colder than zone 5, there are springs when Forsythia does not flower, although it does not show obvious signs of winter-kill, and the branches are not damaged. This is because the flower-buds begin to grow very early, and once they are growing they are sensitive to frost. A period of warmer weather in late winter triggers growth in the flower buds, which can then be killed by the return of cold weather. Since the leaf buds are not so easily aroused from sleep, they are not affected, and grow normally later in spring. If you have a Forsythia which does not flower every year, and you live in zone 4, then this is the reason. These plants should be replaced with hardier varieties, such as ‘Lynwood Gold’, ‘Northern Gold’ or ‘Ottawa’. Good pruning is very helpful with Forsythia bushes, to keep them neat and to encourage plenty of flowers. One-year stems will have a few flowers in their first spring, but most flowers are carried on the side shoots that develop from branches that were new the year before. After that, they become thick and older, with fewer flowers. Immediately after flowering is the time to prune your bushes – do it before and you will lose blooms. Remove branches 3 or more years old as low to the ground as possible, usually to a strong, younger stem that will have grown up in the previous year or two. Shorten back long new stems, that have no side-shoots on them. This will encourage short side branches to form, and these carry many flower buds. It is best to remove a little each year, rather than a lot every few years, as that stimulates lots of long, arching branches that can look untidy. 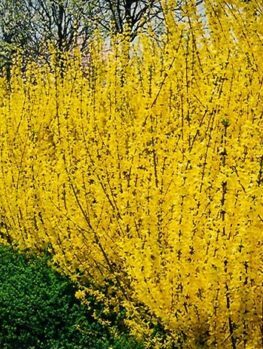 If you have a Forsythia hedge, trim it after blooming, and then lightly in late summer. If you try to keep a very neat, tightly-trimmed hedge, you will remove a lot branches that would have flowered for you. A wonderful way to enjoy an early taste of spring is to bring branches of your Forsythia bushes indoors. It takes a period of cold before the flower buds are ready to open, but by the middle of January it only takes some warmth to start them into growth, (which is why some varieties can flower poorly if there is a late cold snap). If you go out into the garden, still covered in snow, and cut some branches – look for ones with clusters of buds along the stem, not just single buds – and place them in a vase of water indoors, in a week or so they will be in full bloom. Nothing brings the promise of spring closer than seeing those bright yellow blossoms indoors, while outside it is still winter. If the branches you cut don’t show signs of life within a few days, wait a couple of weeks and try again, if you had a late start to winter they might not be ready until February. 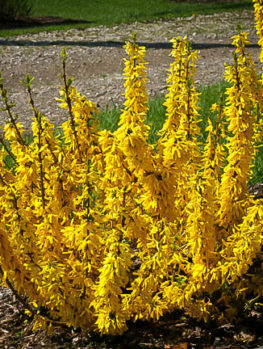 The weeping forsythia was the first species to arrive in Europe from China, around 1833. It was first brought to Holland through the Dutch East India Company, having been discovered growing in a garden in Japan by the famous plant collector and surgeon, Carl Peter Thunberg. It was offered for sale in England in the 1850s. The upright form was brought from China around 1861 by the British explorer and plant collector Robert Fortune, and named after him. Sometime earlier, Fortune had brought over Forsythia viridisssima, another discovery from a garden, this time in China. He later found it growing wild in mountains in the east of that country. Other species were discovered in the early 20th century, and although they have been used to create new hybrid garden forms, Zabel’s classic ‘intermedia’ plants continue to dominate the list of available varieties. New varieties are being produced by breeders, sometimes using modern radiation techniques to create genetic change. The aim is to develop smaller plants, more suitable for today’s smaller gardens. The variety ‘Show Off’ is the best of these currently available.